The Kingdom of Bhutan has been blessed with snow-capped Himalayan peaks, beautiful deep and broad valleys, lush orchards and paddy fields, busy markets, and pristine towns and villages. 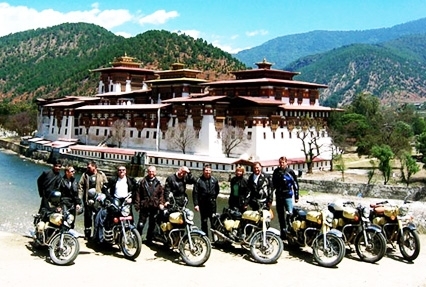 An exotic destination, Bhutan can best be explored through a motorbike ride. Although this landlocked country opened to the world in the 1970’s but still most of it still carries its old charm, which is its main highlight. Traverse through the landscape of this tiny scenic Tibetan Buddhist nation on your bike and unravel its hidden secrets. Riding the bike on roads with varying conditions and along the banks of rivers is not going to be boring at all. Arrive at the Paro International Airport, meet our tour representative who helps you with an assisted transfer to your hotel. Once you complete the check-in formalities, if time permits, you can explore the town on your own. Later, you are introduced to your bike. Once you learn about all the driving rules here, you can ride your bike around the Paro Valley. The lovely Paro town is placed on the banks of Paro Chhu. This historic place is dotted with a number of sacred sites and historical buildings. On the 2nd day of the tour, post breakfast, get all set to visit the important tourist attraction of Paro. The first of the day is to the National Museum- a cultural museum founded in 1968, it houses wonderful specimens of Bhutanese art such as paintings, statues in bronze, handicrafts etc. there are over 3000 items here. It is followed a visit to the Paro Rinpung Dzong- a huge dzong that comprises of a Buddhist monastery and a fortress. It has a total of 14 chapels and shrines. Next in line is the Drukgyel Dzong- a Buddhist monastery and a fortress, now almost in ruins, it was constructed by Zhabdrung Ngawang Namgyal in 1649. This UNESCO World Heritage Site. While returning to the town, visit the very popular Tiger's Nest Temple, also known as Paro Taktsang and Taktsang Palphug Monastery. As this Buddhist sacred site is placed on a Cliffside, you need to hike up to the monastery. Back and forth time would be around 3 hours. Perched 3120 m above the sea level in Paro valley, this monastery has four main temples and various other dwellings. The views of the surrounding from the top are breathtaking. The day starts early. Begin your journey to the capital city of Bhutan, Thimpu via Haa valley. This drive would mean taking a loop around the valley and reaching your destination. During this journey, treat your eyes to the superb natural views. Drive past the Chelila pass placed at an altitude of 4000 m. The Himalayan ranges seem closer and even more beautiful. Halt for lunch at Haa Valley. Later on, continue to Thimpu, crossing beautiful villages and enjoying lovely views. On arrival in Thimpu, check-in at the hotel. After check-in formalities, the day is at leisure. Indulge in a city tour including Trashi Chhoe Dzong, Changangkha Lhakhang, National Memorial Chorten and more. 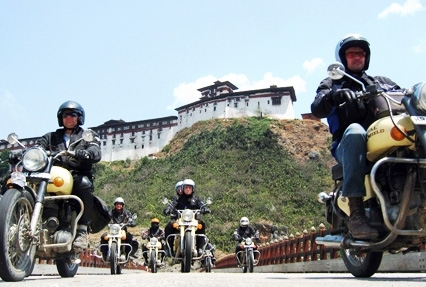 Today, get onto your bike and start driving towards Punakha, the former capital of Bhutan. While on the way to Punakha, you cross Dochula Pass, lying at an altitude of 3150 m above the sea level. If the day is clear, you are going to have an exciting views of the Eastern Himalayan range. After some time, start your descending drive to the Punakha Valley, at an altitude of 1350 m. This drive is going to comprise of a number of sharp turns but the views of the valleys and the mountains are going to be enchanting. After arrival in Punkha, check-in at the hotel. Relax for a while and later, embark on exploration tour of the legendary Punakha Dzong also known as Pungtang Dechen Photrang Dzong. One of the most magnificent structures, this palace was erected in 1637-38, by the 1st Zhabdrung Rinpoche, Ngawang Namgyal. 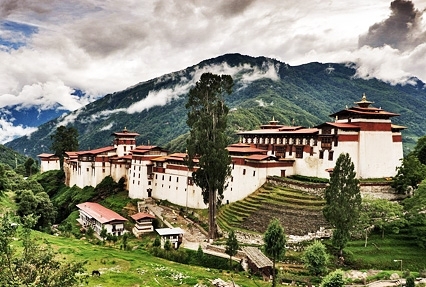 It is the second largest and second oldest dzong of Bhutan. It lies on the confluence of Rivers Pho Chhu and Mo Chhu. On the 5th day of the tour, you begin your journey towards Trongsa. This ride takes us through 2 major passes as well as Wangdue (1350 m) a small town. If you wish, you can halt at a number of attraction and later continue to Nobding from where a steep ascend to Pelela Pass (3300 m) starts. This is followed by a descending ride traversing through the pastureland of Sephu where you come across the heritage Chendebji Chorten. Stop here and relish your packed lunch and then continue your journey to Trongsa, perched at an altitude of 2350 m above the sea level. On the way to this lovely place that was earlier known as Tongsa, you drive past a number of sharp bends, lush forest cover and stunning waterfalls. During this ride, you get nice views of the southern Trongsa Valley and Trongsa Dzong. Upon arrival, check-in at a hotel. The day is now at leisure. Start your day by visiting the magnificent Trongsa Dzong, Bhutan's largest fortress. Overlooking the valley of River Mangde, this dzong has a rich history that dates back to the 16th century. The complex has a number of structures. The fortress offers impressive views of the town. This place becomes the venue of Trongsa tsechu festival, held in the months of December or January. Later, continue your motorbike to the Bumthang Valley. This ride is short and simple. On the way, you traverse through lovely villages. You drive past Yutongla Pass (3400 m), before a descending trail to the enchanting Bhumthang starts. On reaching the Bumthang Valley, check-into a hotel. Later, you are free to explore the place on your own and get your hands on souvenirs to take back home. The 7th day of the tour is for sightseeing in Bumthang including Jakar Dzong- also known as Jakar Yugyal Dzong, it is built on a ridge overlooking the town; Kurjey Lhakhang (Monastery) - carrying the remains of the first three Bhutanese rules, it also has a huge tree believed to planted by Padmasambhava and Tamshing Monastery- also known as Tamshing Lhundrup Choeling Monastery, it was erected by the Bhutanese saint and cultural hero- Pema Lingpa in the year 1501. Sightseeing is followed by lunch. Post lunch, you can either enjoy a ride to Mebar Tso or can simply ride through the Valley. Also known as the Burning Lake, it is known to have a connection with Guru Rinpoche, the Master of Tibetan Buddhism. The ride for Mongar begins with some wonderful and diverse terrain and till 3 hours, you are going to feel like you are looking at the Alps. Today you drive on the Thrumshingla Pass at an altitude of 3750 m. if the weather is clear have a look at the mighty Mt. Gangkhar Phuenseum, at an altitude of, it still remains the world's highest unclimbed mountain. As you drive past the pass, you officially enter into Eastern Bhutan. In a span of around 2 hours, the road's altitude descends down to 2800 m. from here there is going to be a change in vegetation and temperature. Cherish the lovely views. You are presently driving on the Highway 1 of Bhutan. As you come close to your destination Mongar, the air gets thicker and the vegetation, extremely fertile. After completing the check-in formalities, the day is spent at leisure and is for relaxing. Day 9 begins early so that you enter Trashigang early and partake in sightseeing. Like day 8, today also you cross only one pass but with superb riding conditions. As you move out from Mongar, the road alleviates as you cross the power station and the Buddhist College at Kilikhar, after which is descends into lush blue pine and rhododendron forests. Along with admiring the lovely views, be careful as there a few sharp turns. Journey includes traversing through rhododendron and orchid forest. Today, you might take long to cover 92 km as there are a number of places where you are going to stop and click photographs. There are a number of eating joints and bars too, on the way. After finally reaching Trashigang, check-in at the hotel and you can explore this extensive town on your own. Also known as the 'Jewel of the East', this place is located on a scenic hillside. It is also the base destination for a number of popular treks. On the 10th day of the tour, get ready for the beautiful Yangtse region, placed the very eastern-most portion of Bhutan, it shares its borders with Arunachal Pradesh, an Indian state. This bike is interesting and filled with superb views as you traverse local villages and tiny settlements that lie along the road. Drive past along a splendid valley floor lying close to the river. On the way, you can explore popular attractions like the Gom Kora Monastery (Gomphu Kora) - one of the most revered monasteries in Bhutan, it is site where Gure Rinpoche has meditated and left his body impression on a rock and the Duksum village- a lovely place to savor tranquility and scenic beauty. As you arrive in Yangtse, complete the check-in formalities and get ready to visit its popular attraction the Chorten Kora Monastery. Constructed way back in the 14th century, this monastery is one of the most popular monasteries in Bhutan that is dedicated to popular saint Guru Rinpoche. Every year, it becomes the venue of the very popular Chorten Kora Festival or the circumbulation ceremony. 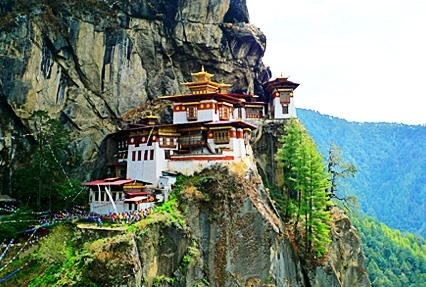 Day 11 is the last when you are going to explore the wonderful nation of Bhutan. Start your bike ride on superb meandering roads that are filled with verdant vegetation, and pine and fir jungles. En route, you can make a halt at the Sherubtse College, which is the only center for degree studies in Bhutan. Later, continue your drive, crossing Khaling, a small town and, the villages of Wamrong and Deothang. Finally, you arrive at the foothills of Samdrup Jongkhar. On reaching here you realize that you have traversed Bhutan from west to east on Highway 1. Complete the check-in. Samdrup Jongkhar is a scenic and serene town that shares its border with the Indian state of Assam. You are free to visit the popular attractions here such as Samdrup Jongkhar Dzong, The Dratshang, The Zangdopelri, Mithun Breeding Farm, Dewathang etc. On the last day, get an assisted transfer to the Guwahati airport to board a flight for your onward destination.